Gabriel Halpern, owner of Yoga Circle in Chicago, IL, fills us in on how he got started in yoga over 40 years ago. 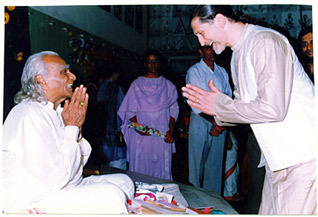 In an ashram in California, he started learning, and teaching. From then to now, Gabriel talks about the yoga path, the roles of a teacher, managing family and yoga, and leadership. Lastly, he discusses how yoga can help create a future that is worth living.